What Others Have To Say!! My friends in a Neighboring country say that "We have everything that you have in India except two things- the Taj Mahal & Lata Mangeshkar". She rightfully is the Voice of the Millennium. I have been listening to her songs since my childhood. Very few singers have the range that she has in her voice. She has been singing for the last 55 years. Her voice is sweet, her pronunciation - excellent. Make her sing any song in any language - Tamil, Bengali or any other she can sing brilliantly. She has perfect tuning. And, whenever she sings, you will feel as if someone is singing in a temple. Allah tero naam by her is my favourite. Vaise hi Lata Mangeshkar ki Awaaz Kudrat ki Takhleek ka ek Karishma hain. Ab main Lata ke bare mein kuch kahu, yeh to Sooraj ko Diya dikhane ke jaisa hoga. Jis ke gale mein khud swayam Saraswati baithi ho. Jiske man mein, Uske dhayan mein Manoranjan ki taraf hi nahin , ha Gan to hain, Sangeet to hain, Shastra hain, Kala hain. Vo ek dharam samajhkar apne Desh aur apne Desh-vasiyon mein jitne peedith tusharthi hain unki sewa mein lagi hain. Main dhanya hoon ki saans hain, jaan hain aur Inse yeh kah sakta hoon ki Sun Sahiba Sun, Pyar ki dhun, Maine Tujhe Chun liya tu bhi Mujhe Chun. Jis desh mein Ganga behti hain uski ek Tehzeeb hain aur woh yeh hain ki jaha Lata Mangeshkar jaisa Mahan Kalakar perform kar gaya ho, us Stage par kisi doosare kalakar ko aana nahin chahiye par unhone bada bhai banakar mujhpar aaisa zulam kiya hain ki har tarah ki badtameezi ki mujhe Ijazat de rakhi hain. Lata kisi tareef ki nahin, balki parastish ke kabil hain. Unki awaaz sunne ke baad kuch aisa aalam-tari ho jata hai jise bayaan karna bada mushkil hain. Yun samajhiye jaise koi dargah ya mandir main jaye, to vahan pahunch kar ibadat ke liye khud-ba-khud sar jhuk jaata hain aur aankhon se besakhta aasoon behne lagte hain. Lataji ko Allah ne awaaz di hain, Ilm unhe unke Wallid Saab se mila, Khuda ki taraf se unpar Karam hain. Lata Mangeshkar ek Ehsaas hain jo Mehsoos kiya jata hain Baiyan nahi.Yeh ek Naam hain jisse Sun kar mere Man mein Sukoon aur Chehre par Muskurahat aa jati hain. To me she is etherial someone from another world, larger than life, no less than a Godess a 'Devi'. This one Name evokes a million feelings inside me. I have cold feet, weak knees, a knot in my stomach, a smile on my lips & tears in my eyes. In other words I feel 'Alive' when I hear this name Lata Mangeshkar. I wish being an actress and have the honour to perform a song sung by Lataji on screen. Usually it is an artist who follows the art. But in Lata's case, it's the art that followed her. It is indeed an honour for us heroines that such a great person has done playback for us. Lata Mangeshkar is not a personality that comes along in every century, not even in two or three centuries. Her talent transcends time. It's our good fortune that we co-exist with her. Yeh bade bhagya ki baat hai. Her command over the twelve notes without overdoing them is amazing. When she sings a happy song, she makes us laugh. When she sings a sad song, she makes us cry. She can convey every emotion through her voice. I've no words to describe her talent. A talent like her comes along once in a thousand years. Nobody has heard the mythical Tansen. But to our good fortune we have heard Lata Mangeshkar. She has become legend in her own lifetime. There have been other good singers like Kishore Kumar, Mohd Rafi and Asha Bhosle. But no one can equal didi. I've been a practising musician for 50 years. I've never encountered a singer like her. And I'm not saying this because she's my sister. I could say the same about my other sisters Ashaji and Ushaji or about my guru Ustad Amir Khan. But I won't. They are not as timeless as Lata Mangeshkar. There was only one Krishna in the Mahabharat. Likewise, there's only one Lata Mangeshkar. There are only three things in the 20th century that would be remembered: "Lata's birth, man's conquest of the moon and the breaking of the Berlin Wall." I don't know why but a newcomer always feels maybe Lata Mangeshkar will not agree to sing for me because you are probably not that good and the minute she sings for you, you feel that she has accepted you as a good artiste. The Earth has but one sun, one moon and one Lata. Everywhere in India & abroad she created a kind of magic .After that every heroine ,film director or music composer wanted only Lata to sing. And Master Ghulam Haider's prophecy that she'd touch the heights of the skies came true. Lataji hain to, Hum hain, hamari Khoobsurati hain, hamari Adakari hain. High notes,Low notes this or that, nothing she would never be told as to what to do while singing I used to be told but not her.She was never told , she never needed to be told. It isn't as though she always got great lines to sing. She was given the same standard of lyrics as others. It is the magic of her voice that elevates the songs that she sang. 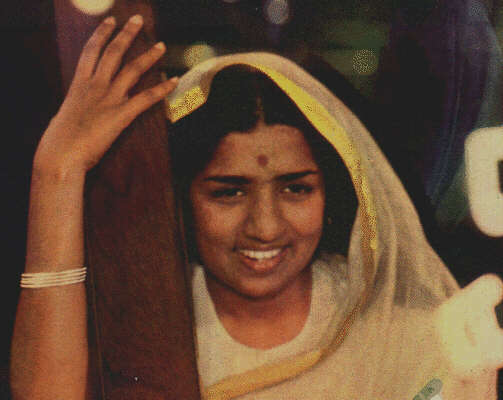 Lata Mangeshkar didn't become Lata Mangeshkar without hard work. You know during the recording of the Amar song, 'Na milta gham', Lata couldn't get one antara exactly right and she insisted on trying again and again for 17 takes till she finally fainted in exhaustion. When she became conscious again, the first thing she wanted was to try again. Lata is Lata. She is peerless. Practically all my songs have been sung by Lata. I've rarely felt the need to turn to someone else. Lata is a trained singer & so versatile. She can sing anything from classical,even frothy songs. Lata is a phenomenon. She is one of a kind. Didi ki main bhakt hoon, har waqt unki Awaaz sunti hoon to mere Rongte khade ho jate hain.Didi ko main un Logon mein se Manti hoon jinhone is Duniya mein bahut bade kam kiye hain. Jinki awaaz ne is duniya ke logon ko dukh ke Mauken per Shanti di hai. Didi ke samne bus yahi kah sakhti hoon ki jahan Devatv ki Prachti hoti hain Uske Samne sirf apne Haath judte hain. Koi to kamal ki baat hain Lataji ki, ki vo Itni badi aur achhi Kalakar hain, magar vo kabhi mere khayal se yeh nahi sochati ki, ha Main to Itni badi Aritst hoon, Main Lata Mangeshar hoon to main koi bhi Waqt koi bhi Geet ,kisi bhi tarah galu. Hum sab ke liye unhone gaya mere se pehle-wali generation ke liye bhi gaya aur aaj tak ga rahi hain.Unme Ek bahut badi khoobi hain woh yeh ki vo jis artist ke liye gati hain vo uske hisaab se gati hain. Lata was a Godsend to us composers because with her around there was absolutely no limitations placed on our range. Such was her vocal artistry that we could explore the most complex reaches of compositions in the knowledge and confidence and that she could take it all in her stride. For me, she's like a member of my family. I've been listening to her songs since I was about four years old. She's like a goddess for me -- someone I've always followed. She has been my inspiration, I've tried to mould my career like hers. She's perfect -- her voice, the way she sings. Her voice is so beautiful that even if she playbacks for some ordinary-looking actress, her face starts looking beautiful. Unparalleled - there is no other word. My love for film music arises because of Lataji's songs. Not just her voice, she is the ideal exponent of everything to do with music. For me, there cannot be anything greater than her... I'm not talking about the pure classical format, but the light music format with words in it. 500 years from now, there'll be only two names which will be remembered in Indian music, Tansen and Lata. The greatest songster of all times. Before the advent of playback singing the songs that we actresses sang were songs only in name. It is only after Lata started giving playback, that real music happened. The more she suffered, the more her art excelled. The more she hums, the more she sings, the richer our musical heritage becomes. What we classical musicians take 3 and 1/2 hours to accomplish, Lata does in 3 minutes.